I have never been a really big fan of cauliflower, but I love potatoes and spices. 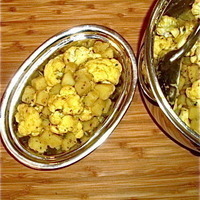 This dish, known as 'Alu Ghobi', has long been a favorite vegetable side dish in my kitchen. It is simple, easy to make and very healthy for you. One seldom finds a cauliflower dish on the average restaurant menu. But you need not be a vegetarian to thoroughly enjoy Alu Ghobi along side a roasted chicken or kababs. If you have never had this dish, and you are not a fan of cauliflower - I urge you to give this a try before you swear off cauliflower forever. Just like home in India. Just might need to add a little more chile. I made this to serve with a roast yesterday and it did not disappoint! Fascinating way with spices. The cauliflower and potatoes so amber and tasty. Thanks for posting! Sounds very delicious. I like to give this a try soon. Another veggie recipe to learn. My friends - I am an American Research Chef. Note that the heading says "Indian style". It is not presented as an 'authentic' or Indian recipe, because I am not of Indian extraction. Nowhere in the body copy do I refer to an "Indian friend", or mention an Indian friend gave me this recipe. As clearly stated on my bio page, I often take tried and true recipes and find new ways to present them to appeal to a middle-American palate. The addition of a little chicken stock, while you may well be correct from an 'authentic' perspective, was added, not to offend your culinary sensibilities, which appear considerable, but to get some country neighbors of mine to venture out just a bit into the flavor palette of a place to which they will never travel. As I also mention, quite clearly, I do not like cauliflower, but I do enjoy this dish. Sorry to have offended you, but this site is for cooks and chefs to express themselves, individually, with credit where credit is due. If I wanted to enjoy Alu Ghobi your way, I would not have posted my recipe, but would have tried yours, instead. All things considered, I do appreciate your comments and my opportunity to address them. oops,did'nt mean to step on your toes...but with comfort foods such as aloo gobi...emotions and memories are attached...so maybe I got carried away...see your point totally.. I love cauliflower and Indian spices. Can't wait to try this recipe. Looks delicious. Hi, Judee! And I await your report. This is quick easy and even good the next day - provided there is any left! Thanks, Arturo! And all the best to you in 2012!